Bell foundry tradition in Podlasie dates back to the middle of 19th century. That was the time when the first bell foundry was founded in Wegrów. The founder's name was Antoni Wlodkowski. The master was childless. Bell foundry is a hereditary occupation where gained experience and secrets are passed on from generation to generation. Jakub Kruszewski helped him and learnt foundry profession from him. After the First World War he took over the work place and, in 1920, he started to cast bells himself. After the death of Jakub Kruszewski in 1946, his son, Antoni Kruszewski, inherited the foundry. He was the one who acquainted his two sons: Andrzej and Adam, with arcane bell foundry profession. The present owners of the company cultivate long traditions with a help of their sons: Wojciech (Andrzej's son) and Antoni (Adam's son). 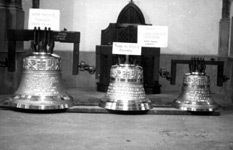 Throughout the years Kruszewski founders have cast over 2500 bells, which may be heard in different parishes all over Poland. Our bells can also be found abroad, e.g. in theUSA, Ukraine, Belorussia, Lithuania, Siberia, Rwanda, Papua-New Guinea. Apart from that, our company has cast a number of naval bells, small yacht bells suited to the occasion for yachts and as well as a trophies for the winners of the Polish "Operation Sail" . The most famous work of Antoni Kruszewski and his sons are the bells granted for the Royal Castle in Warsaw. The clock bells made for the Royal Castle differ in shape from standard bells. They are flatter, with its shape resembling a hat. The bigger bell weighs 840 kilos and strikes hours, while the smaller one, weigh 465 kilos and strikes every quarter of an hour.